Capcom and Level 5 have jointly announced that the top-hat professor will be taking on the spiky-haired lawyer in Professor Layton vs. Phoenix Wright. Last month, when news broke that Level-5's Jiro Ishii was working on the new Ace Attorney title, I idly mentioned that it could in fact be a crossover between the Ace Attorney series and Level-5's own Professor Layton puzzlers. In fact, I believe I said that it "would be the best game of the past five years if they did that." Well you know what? I called it. Last night, at a Level-5 press conference devoted to the developer's upcoming Professor Layton and the Mask of Miracle and Ni no Kuni, the studio dropped a bigger bombshell. It revealed a collaboration with Capcom's Ace Attorney team - Professor Layton vs. Phoenix Wright, a new title in development for the 3DS. Despite the "Vs." in the name, this isn't one of Capcom's traditional "Vs." fighters (which would be a hilarious image, now that I think about it). Nor will the two characters be pitted against each other - Layton and Wright will be working together to solve the mystery du jour. Naturally, as one would expect from the respective franchises, Professor Layton vs. Phoenix Wright is described as a "combination of puzzles and a crime mystery," though we know little else about the title other than that it will involve a "majo saiban," or "witch trial." This, then, is likely the mysterious project that was teased on the Ace Attorney anniversary site last week. Frankly, I don't care how little we know right now. The Professor Layton and Phoenix Wright games are both some of the finest titles available on the DS. There is nothing that I do not love about this. I mean, holy crap guys, it's a Professor Layton/Phoenix Wright crossover! What more do you want? 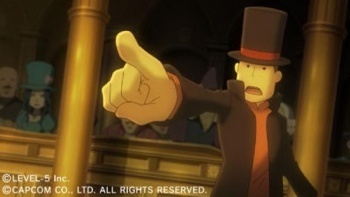 Edit: The game's Japanese title is Layton Kyouju vs. Gyakuten Saiban, which actually translates to Professor Layton vs. Ace Attorney - but frankly, don't you think Professor Layton vs. Phoenix Wright is a much better title? I sure do. Update: Here's a new, high-quality trailer. Check out more on the official site. Yes, it's been over half a day since I learned about this news and I am still excited.